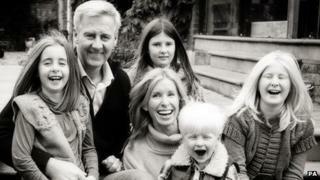 Police investigating the deaths of a father and his daughter in a speedboat accident in Cornwall have said a "kill cord" device is a key focus. A kill cord attaches to the boat's throttle and driver so if the driver goes overboard the engine cuts out. BSkyB sales boss Nick Milligan, 51, and his eight-year-old daughter Emily were thrown from the boat in the Camel Estuary, off Padstow, on Sunday. Four other family members struck by the boat were taken to hospital. Police said Mr Milligan's 39-year-old wife Victoria and their four-year-old son Kit remain in hospital with "serious, potentially life-changing injuries", while their two other daughters Amber, 12, and Olivia, 10, suffered minor injuries in the accident. The family are from Wandsworth in South West London. Adrian Floyd, the headmaster of Finton House School in Tooting, said Emily was a "bright, lively and much-loved Year 4 pupil". He said the family had a "long and close" association with the school, which was also attended by Emily's brother and one of her sisters. Mr Milligan was one of the school governors and had been managing director of Sky's advertising sales division, Sky Media, since 2004. The injured family members were hit by the 8m (26ft)-long Cobra rigid inflatable boat (rib) - which can reach speeds of about 50mph (80km/h) - while it was going round in circles. The boat was stopped after a local waterskiing instructor Charlie Toogood jumped on board. Mr Toogood, 32, a former RNLI crew member, has been described as a "hero" for his actions. He said: "There were many 'heroes' in this tragic incident, all of whom did a remarkable job in difficult circumstances. "However, now is a time solely to reflect on the bereaved and injured family members and their wider family and friends. "My thoughts are with all of them and will be for a long time to come." Matt Pavitt, coastguard sector manager for North Cornwall, said: "Without doubt, without [Mr Toogood's] intervention, we could have been dealing with a far more serious situation." Fitting the kill cord has been standard practice by manufacturers for many years, said Richard Falk, training manager and chief examiner at the Royal Yachting Association (RYA). "It is possible for the operator, the driver of the boat, to connect the kill cord to the throttle so the engine will work but they don't connect it to themselves. "If they then move away from that throttle or steering position the engine won't cut out," he said. He said he could not comment on the Padstow incident, but where a kill cord was not operating properly and a driver went overboard the prospect of a power boat turning in circles as it did in the Padstow tragedy was a rare "worst-case scenario". Supt Jim Colwell, of Devon and Cornwall Police, said a mechanical examination of the boat had taken place, carried out by forensic experts and Marine Accident Investigation Branch (MAIB) inspectors, to identify the cause of the "sad and tragic" incident.